Danny, what do you think?? Remember good judgment comes from experience, experience comes from bad judgment. Can the gun assembly be removed from the feed head? Meaning, does the machine end of the gun lead have a power pin that inserts into a socket on the feed head? The angle of the neck on the gun seems a little flat? The gun on my CK 175 has a flatter neck angle (around 30º) it works fine for most joint designs and positions; however, it is a little annoying for flat groove joints. Spray arc welds almost allows wet out well, so were is a picture of one of the short arc welds. This unit has an inductance control, correct? I will run some different wires like HB-28, L-56, and whatever else I have. It came with All state .030 and it seems good. Esab 86?? It wets out fine. Very similar arc to the Thermal 400 mst. Inductance is 00 to 10 with 5 being the setting for mixed shielding gas. Not as fine tuning as some machines in inductance settings,but enough. CO2 starts at 00 setting. I only messed with it a bit the other night, and hope to get out there again. The gun angle is OK with the socket setup . I do like the blue Binzel better, but I figured I would. I have not tried to get the gun off yet, so I don't know just how it's put together. There is a nut that holds the liner in, but I am not sure if it holds the gun on too. I can't see a block that holds thing, but I will look closer. I ordered a Teflon liner, and a U groove feed roll for Aluminum. I have some .023 Silicon Bronze I want to try with this unit, and it takes the same plastic liner. It has a slope-setting for that stuff. Here is a bit more info on this thing. Nothing on how the gun comes out, but I am sure you have to split the case to remove it Since it's part of the welder, maybe it has a three year warranty too. I really like how easy it is to load, and thread the wire. No adjustment for the spool tension, and the wire threads though super easy. About the fastest machine to change out wire there is. The drag is always perfect by design. Tested with other spools of different brands, and amount on the spools. Looking at the product literature I suspected the gun wasn't easily removed from the unit. The permenantly fixed gun is the one thing I dislike about my Handler 125 EZ. I don't change drive roll to often, but it is a little disappointing to see that ESAB didn't go with some kind of tool-less quick change design. Your picture makes it seem like there is a fair amount of distance between inlet guide tube and the drive roll. Is the gap as large at picture makes it seem? You just have to flip it over if you use .023 wire. At least it's a .030/.035. Get this the liner is a .023/.030, and the optional one is ...... Calling Esab to see what really is up . Yes, there is quite a gap, but I have not noticed any feeding issues yet. Might with smaller wire, but I doubt it. I am pretty sure I am going to stick with .030 for the most part, so not too worried about changing things over. Made in Poland by the way..
PS, the drive motor is really strong, and not like a lot of little machines out. Still I set it up by the book, and not too tight on the feed rollers. Last edited by Brand X; 01-21-2012, 03:03 AM. Lincoln used a plastic wire reel retainer about like the red one used by Esab Caddy. You adjusted reel drag with screwdriver and adjustment screw hidden inside reel axle tube. It worked ok but if adjustment is needed not as easy as other systems. Just noticed the spring behind the red knob. Lincoln didn't have that spring making adjustments sometimes needed. That thing is nice,appears to have power to spare,very lightweight also from what Iv read.. Looking at the thing, you would think it would be a poor setup. In practice, it functions very well. I was skeptical of the whole drive arrangement layout, but it fooled me. I am use to some really decent wire drive layouts, and was just sure this was going to be a POS. The gun layout is a non issue too. Meaning if it gets damaged, i will have to take out 11 screws to get at it. ON the plus side, it has no contactor wires to snag, and the gun/cables roll up very nice on the machine. The wire drive floats a bit, to give it a bit of wiggle room if the gun is hit. Took it apart to see how the gun comes off. It's not too bad, but you have to remove 11 screws, pull the front cover off by unplugging from it's ribbon connector, loosen the 17 MM nut inside the drive compartment, remove the cable from the positive lead stud,unplug the trigger wire in the same compartment and clip the gas hose clamp. I found out the drive motor/housing will not come out without removing the circuit board. (Not necessary to get the gun off) With some long nose needle nose, you can get around that one though. I ended up tightening them because they were left loose from the factory. I was wondering why they designed slop into that thing. Seems like if they designed it more like the Kemmpi mini-mig setup, it would be a big step forward. The Kemmpi seems to miss the mark on cable management, which would be way more annoying to deal with. Still a nice unit!! Last edited by Brand X; 01-21-2012, 05:10 PM. Cable storage looks like it is very well thought out. 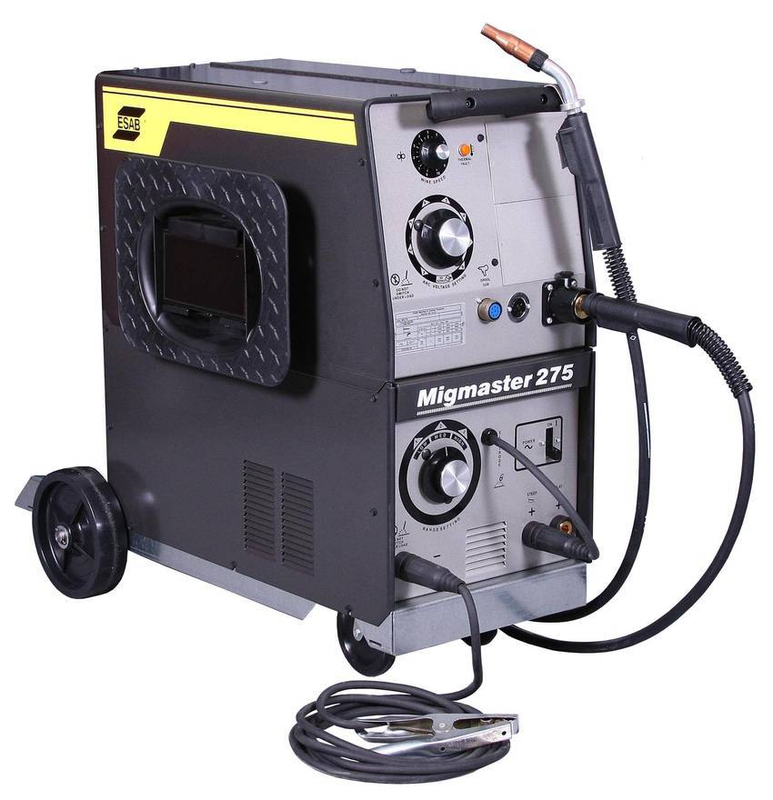 To bad ESAB didn't invest some time in creating some type of cable storage on my Migmaster 250. Since they are falling within the price range that I can afford, these smaller compact units (C200i and 181i) that offer an inductance control (option that I've always wanted) are really tempting me to add a new unit by summer time. I think you really should look into the the Thermal machine. Burn-back- finer control of the inductance is something you would like. The Esab seems not to need the burn-back, just like my Thermal machine setup with the Thermal feeders. Some machines do, and others don't. The Kemppi has really impressive simplified display and adjustment system. If I wanted a simple tapped unit with nice options, I would go this way over a Migmaster 280. Last edited by Brand X; 01-22-2012, 01:57 PM.